He isn’t just a “story.” Stories — fictional stories — have an ending. They are contained in books and television shows and movies. We do not weave an elaborate web of deceit to convince our children that Snow White really exists, or that Mickey is an accurate portrayal of how mice really behave. If they ask us about the geographical location of Neverland, we’ll tell them Neverland is just imaginary. Lie: a false statement made with deliberate intent to deceive; an intentional untruth; a falsehood. He’s an entertaining, fanciful, merry ol’ lie — but he’s a lie all the same. Is Santa true? No. Do you know he isn’t true? Yes. So what do you call it when you attempt to convince someone of an untruth? Fun? OK, but it’s a fun… what? A fun lie. Look, my own mom and dad “did the Santa thing.” They’re great parents and fantastic people, so I’m not making any judgments about parents who “do Santa.” You could be perfectly wonderful, loving, and caring, and still participate in this holiday fraud. But I think it might be time to reconsider the practice. Yes, it’s a longstanding tradition, but not all traditions are worth continuing. 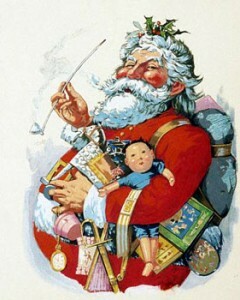 Take, for example, Santa’s evil cousin: the Bogeyman. In many cultures, parents used to tell their kids that the Bogeyman would come to their room at night and eat them alive if they didn’t behave. Depending on the country, sometimes he would kidnap you and make you his slave, and other times he would just cannibalize you upfront. There have been many variations — and, hey, do your own thing with it, have fun — but they all shared the common “do what I say or a mythical beast will brutalize you in unspeakable ways” message. There’s a lot that past generations got right about parenting. This isn’t one of them. Certainly, Santa Claus is far more pleasant than the Bogeyman, but I submit that they are both relics of a time when it was acceptable to coerce your children with mystical scare tactics. I don’t intend to write a lengthy refutation of every pro-Santa argument; I’m already devoting enough space as it is to this gluttonous stalker. I’d like to specifically address only one point on the Santa platform. I hear it all the time, and it goes like this: Santa makes Christmas magical. If you take Santa away from your kid, you’ve taken all the fun out of the holiday. Please, carry on with the Kris Kringle schtick for whatever reason you like, but not this one. Any reason but this reason. Santa makes Christmas magical? SANTA? This is what I hate about the guy. He’s a Christmas-stealing glory hog. He’s a diva; everything has to be about him, doesn’t it? We invite Santa to Jesus Christ’s birthday party, he brings his stupid elves and a bag full of cheap toys, next thing you know it’s his party. If he leaves, apparently the party’s over. How can we have fun without magic? Well, you know, there’s still Jesus. The Messiah. The Son of Man. Jesus Christ is better than magical. He offers something far greater than toys. He doesn’t have flying deer, but he has armies of angels. He doesn’t live in a cabin up in the North Pole, but He does live in a dimension that transcends time and space, and He invites us to join Him there in unending bliss. He doesn’t visit every house on Christmas night, but He’s always present, everywhere, all the time, because He is an omniscient deity. In other words, Jesus is WAY cooler than Santa. This is a message that is, I think, tragically lost on many children. Let’s be honest: Christmas ain’t big enough for the both of them. Santa, the fun fictional character? Sure. Santa, the silly game of make believe? Yeah, he can join the festivities without overshadowing the Man of the Hour. But Santa, the actual real person who gives out toys made by elves? THAT Santa, being a man of considerable girth, tends to crowd Jesus out of the hearts of many kids. Yeah, Jesus is the Messiah, but Santa has TOYS. Who comes out on top in that scenario when you’re 4 years old? Some children are so full of natural grace that even a pudgy mystical gift giver can’t distract them from Jesus. But normal kids — kids that are closer to how I was as a child — will find their allegiances split. I can’t believe that I’m the first 5 year old who impatiently sat through church on Christmas Eve, ignoring all of the stuff about nativities and wise men; entirely engrossed in visions of reindeer, elves, Santa Claus, and Game Boys (it was the 90′s, kids). Why do we need to spruce up the Birth of God by adding some nonsense about a fat guy in a red suit? God, the Ultimate Power in the universe, sent His Son to Earth. He was conceived inside a woman’s womb and was born into this world in the same manner that all humans are born. He walked among us, performed miracles, healed the sick, raised the dead. He was murdered and then came back from the grave, and He now sits on His throne, at the right hand of God the Father. On Christmas, we celebrate His arrival, and the beginning of the epic journey that ended with Christ’s triumph over sin and death. He watches over us at all hours, every day, all year, for our whole lives, and offers us healing, comfort, and salvation. His angelic armies protect us as they battle the forces of evil, and He wants us all to join in that fight; a fight that will be won, once and for all, at the End of Time, when He returns in glory. Now, tell me how Santa makes THAT more magical? Santa, the Christmas Lie, is but a whimper and a sigh in the light of Jesus, the Christmas Truth. He can’t bring anything to the table that Jesus hasn’t already provided. So do Santa if you want to do Santa, but you don’t need him to make Christmas magical. Christmas is already more than magical — it’s supernatural.